Monday – slow morning at home in our condo paradise. Going to the Singapore Google office together — the first time I’m going as an employee, an insider. Does it feel different to being here as a curious tourist, as an employee’s partner, as a hopeful job applicant, as a joyful Noogler yet to move to London to start my job? Yes, I guess it does. I feel okay about eating the delicious food, and I feel good about finding a comfortable nook to work from, and I feel proud inviting one close and highly missed friend in for a catch-up coffee in the morning, and another in for lunch. In the afternoon, we leave work together, walking through the Southern Ridges and taking an Uber from Henderson Waves to Little India, where we buy mangoes and eat dinner at one of our favourite Southern Indian restaurants. Walk home in quiet darkness. Tuesday – another long, slow morning. The office is closed for the Lunar New Year, so we work from Warehouse Hotel, just like we did in the good old days, hehe. We eat a late lunch here — their specialty, build-your-own popiah, man, the most delicious meal I’ve ever had in Singapore! In the late afternoon, I take a myriad of work calls from home. 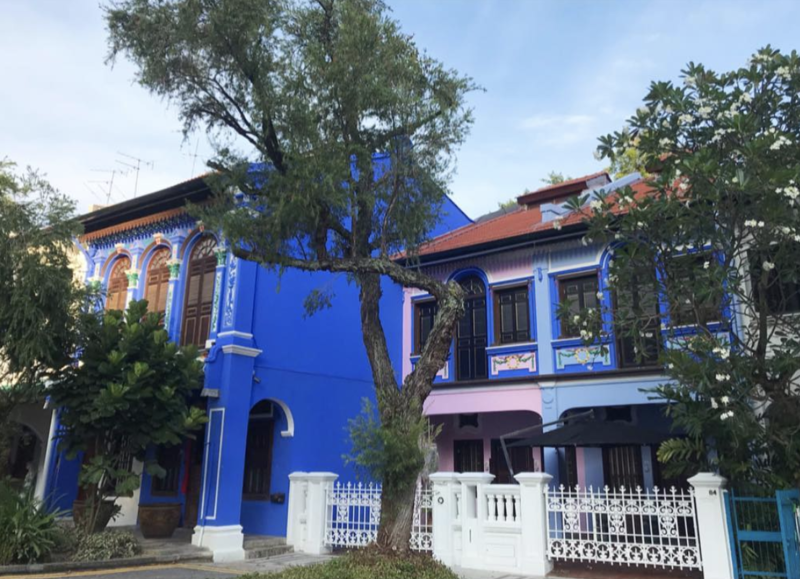 We then skip down past the gorgeous colourful Peranakan houses on Emerald Hill for some air, and loop back up to eat dinner on the balcony, sharing a Japanese beer from a Japanese supermarket on Orchard. Wednesday – swim, yoga, morning hike around the reservoir lake in the wonderful lushness of MacRitchie together, feeling so grateful we get to do that — a few months ago, we couldn’t believe that the walk we took then, there, would be the last, and sure enough, it wasn’t. Tiong Bahru – early lunch with a friend at Tiann’s, where the staff welcome us back happily, and from where I work all afternoon. We then take a scenic route back home, walking along Lloyds Road and eating at Real Food, a blissful, wholesome respite from Orchard. Sanoop takes me to the airport late that evening. It’s incredibly sad to leave him, as always, but we always have each other, we’re always with each other. I miss him even if he’s just at the other end of the pool. We look forward to seeing each other even just after a day at work. Hehe. What is this missing and why? I guess every couple does it their own way, and it requires strength, and calm, and as Sanoop always reminds me, allowing yourself to be with the feelings rather than suppressing them, the good ones and the tough ones. We keep on travelling, making so much of what we’ve been given, and doing so well. When I was a child, I felt homesick, a feeling that consisted of two emotions: fear and love. Now, I feel at home in myself, so ‘homesickness’ has become an isolated sense of love: I love Sanoop and my family and every second of the time we spend together. I don’t fear being away from them, and I don’t fear where I am going even if there are unknown factors involved. It’s a comfort to focus on how I might contribute in this new role, around which we’re revolving both of our lives, how it will develop me as a human being and as an employee … and all of that. But right now I can’t help but think of next time I see him and my family. Hampstead Nesting. I go straight to the office from the airport on Thursday, and straight from the office and home both Thursday and Friday. Eat organic plant-based readymade meals from a health food store in Belsize Park. Light candles. Unpack boxes arriving from Singapore with the few paraphernalia we gathered there. Find new homes for everything, merging memories from my childhood in Denmark and lovelife in the tropics. Something I’ve latently dreamed of doing for years. Comfortably aware that other things than decor were more important at times. And that I could live without. But it just feels so good now. Investing in good quality bed linen. I’m continuing to organise the Danish stuff, and now join the displays in the built-in bookcases by the window seat and other places with some sweet Singapore memorabilia and things we picked up from travels together. Missing Sanoop so deeply. But now my mission is to just revel in my memories, and then create a lovely home for him to enjoy and continue shaping with me when he gets home. On Saturday, a friend from Singapore meets me for lunch at Holly Bush, one of the cosy old gastro pubs in Hampstead. We sit in the charming backroom, which has a fire place, and share oysters and ceviche, catch up, and then walk down through the quaint lanes of the village in the warm afternoon sunlight. It’s so lovely to have this true English experience with a sweet English friend, who was a witness to and part of my life in Singapore as well. We browse in charity shops, boutiques, delis, get coffee at Ginger & White, chatting, chatting, chatting. Drive home in her white Fiat 500 — I show her the flat, she loves it, which makes me feel good. Early to bed, read till I fall asleep. Sunday – morning run on the Heath after drinking coffee and reading the paper in the window seat. Head to IKEA to buy sheepskin and bits and bobs. Meet a friend in Shoreditch in the late afternoon for a walk on Columbia Road, where I buy hyacinths, while she buys a giant tree of some sort. We walk down past the house in Swanfield Street in which we used to live, together with two other girlfriends. Coffee at Allpress as it grows dark. I buy a Himalayan salt lamp in As Nature Intended for Sanoop, and Aesop hand wash, and then take the overground home from Shoreditch High Street Station. Home. Home. Home.